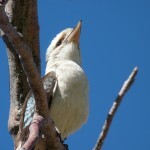 The weather was lovely in SWA over the weekend. Although it was chilly in the mornings (we even had a smattering of frost) it was sunny, blue skie’d and and warmish during the days. To make the most of this unseasonally fine weather we began to think of things to do around Margaret River, and decided to head with some friends and our bikes to Cowaramup. It is, and everyone seems to pronounce it differently too. But it’s actually pronounced “Kuh-wara-mup” – and it means “place of the Cowara bird” in Aboriginal language. 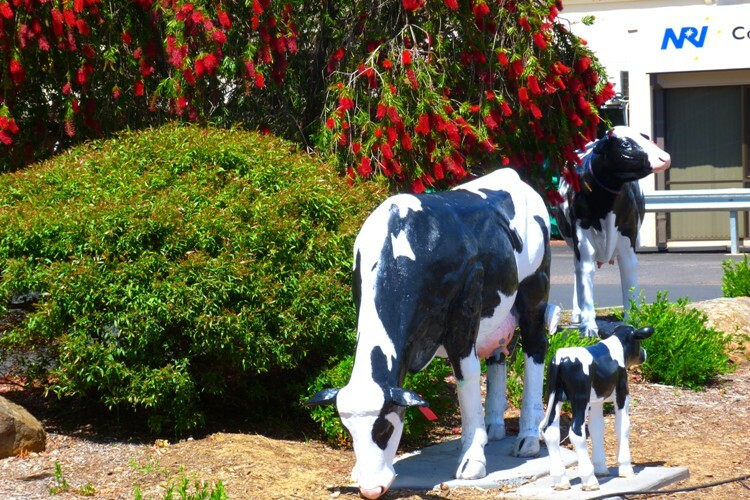 It’s a tiny town about 10 kilometres north of Margaret River with a bovine theme – kids will enjoy spotting the herd of life-size Fresian cows (fibreglass models) dotted around the streets and the play park – look out for Molly Moo Cow. If you look at the names of the shops you’ll be left in no doubt that this area really is given over to cattle and agriculture, and the whole theme gives the place a fun and quirky atmosphere. 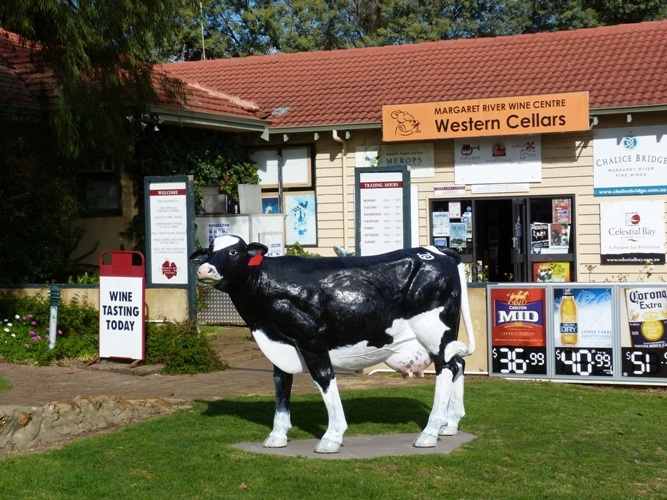 Around Cowaramup you’ll find some fantastic wineries and food experiences and the town has a couple of gift stores and gourmet food producer,s and it’s renowned for … yep, you’re right! It’s dairy industry. It’s also got a sense of humour. As one of our friend’s said when he went looking for a public toilet. “You wouldn’t get away with this sign in a small town in England! 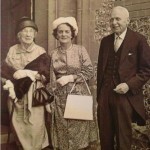 The council would have a fit!” He laughed. We all laughed at the sign! What do you think? Cowaramup, however you pronounce it, was once a stop on the Busselton to Augusta railway, which doesn’t operate anymore. The last train chugged along the track in 1957 but the track has now become part of the “Rails to Trails” cycle and walk track. And that is where we were bound on Saturday morning. From Cowaramup it’s a gentle glide downish to Margaret River 13.5 kilometres away, along a shady track, and breakfast at the Margaret River Bakery is a wonderful thing to look forward to. Coming back it’s slightly up hill so you need a good dose of strong coffee and bacon and eggs to fortify you for the homeward run. 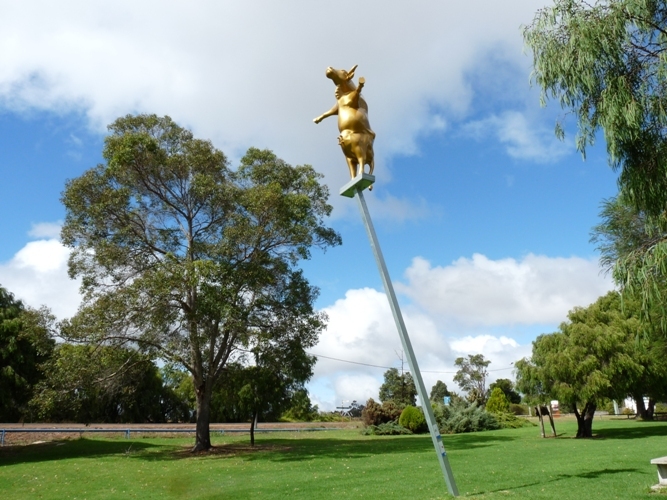 You’ll find Cowaramup on the Bussell Highway, about 12km north of Margaret River (or 3o minutes from Busselton). The hamlet of Gracetown and the beach is situated approximately 10km west of Cowaramup on Cowaramup Bay Road – a road you’ll find on the right hand side, just south of the town. 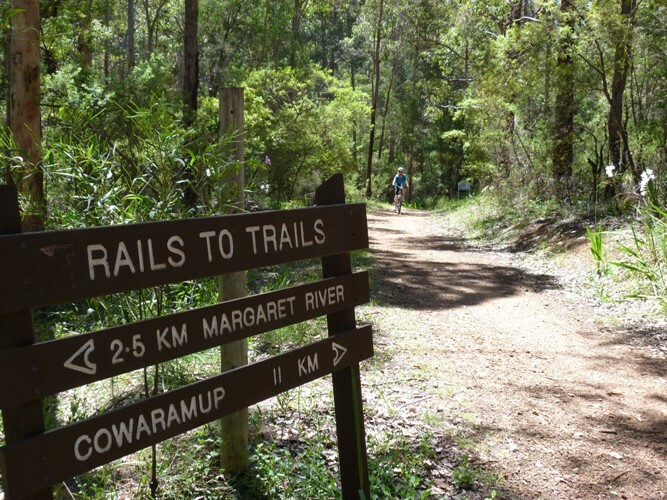 Bike ride or walk the 13.5km rail trail into Margaret River. If you don’t have time to visit wine estates then go wine tastingand buy local wines at The Margaret River Regional Wine Centre right in the middle of Cowaramup. There’s parking right outside. 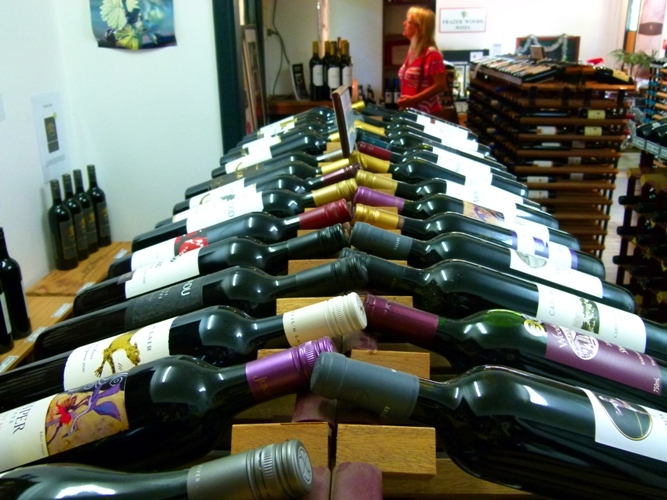 You can also try wines from small local wineries which don’t have a cellar door. Take the kids (and big kids) to the Candy Cow, and buy some lovely fudge, nougat or sweet treats. 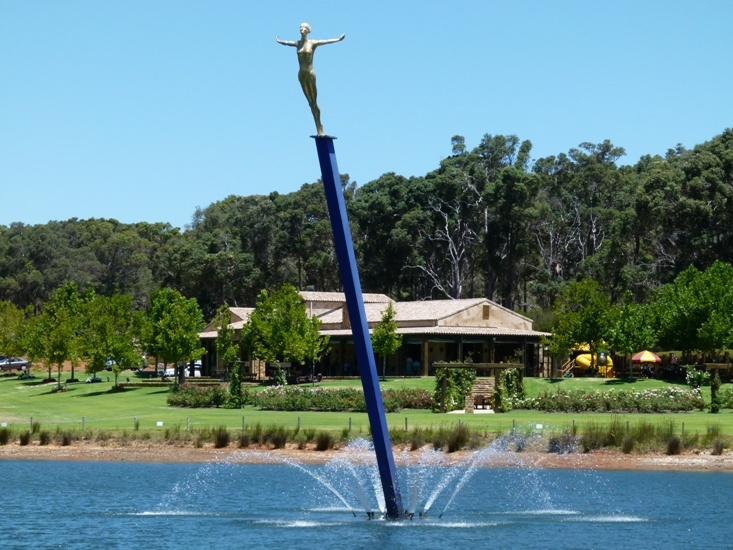 It’s a local artist’s humorous take on Laurance Wine’s “Chick on a Stick’ which you can’t miss if you’re travelling along Caves Road because it soars majestically over the Laurance lake. Drive to the beach 10 minutes away at the hamlet of Gracetown (Movie star, Sam Worthington, filmed scenes for the movie Drift here) and either play in the surf or put on your boots and walk the popular Gracetown to Prevelly section of the Cape to Cape Track. Check out, if it’s the first Saturday of the month because there may be a market in the Cowaramup Hall from 8am – noon. 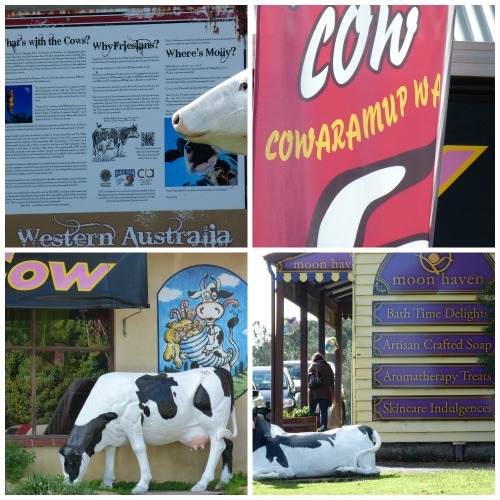 Fancy visiting Cowaramup? What would you like to see or do? We have only just seen the cows in the street a few weeks back when we came through Cowaramup on the way to Margaret River. The town certainly knows how to play on its heritage. Love the rump on a stump! He He, we laugh every time we see it too! 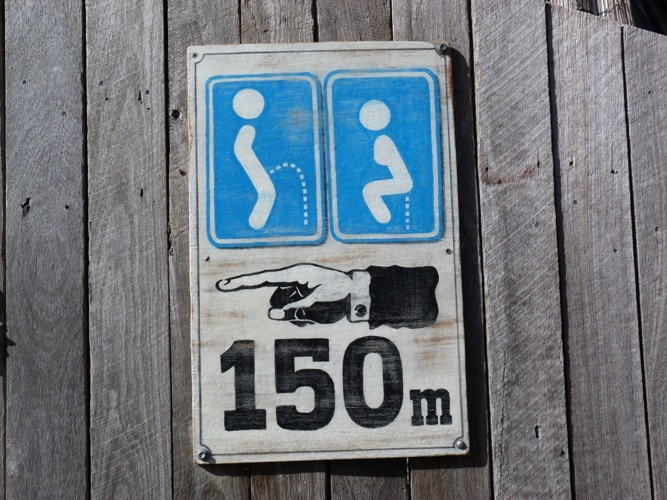 Hahaha, that loo sign is right up my alley!!! But I bet the actual amenities block doesn’t quite live up to it … But no matter!! The cows and chick on a stick more than make up for it!!! Ha Ha Red, Yes, you would have laughed! Wonder what your take on it will be one of these days? 🙂 Can’t wait.